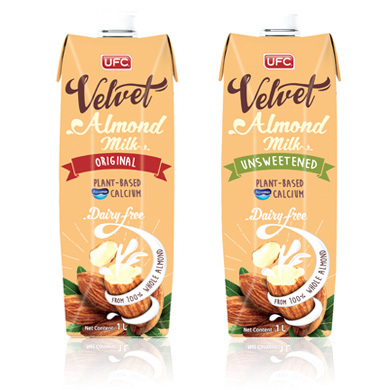 UFC Velvet Almond Milk is a heart-healthy, low-calorie and nutritious beverage made from quality Australian whole almonds. It is added with “Aquamin”, a marine plant-based calcium derived from the red algae Lithothamnion found in the pristine waters off the coast of Iceland. The aquatic plant naturally absorbs trace minerals from the surrounding seawater, creating a structure that is easier for your body to absorb and store the calcium. Almond milk has a pleasant, nutty flavour and creamy texture. It is suitable for vegans and those who are lactose intolerant or allergic to dairy milk. Enjoy UFC Velvet Almond Milk on its own or simply add to coffee or tea, cereal, smoothies and oatmeal. Available in Original and Unsweetened variants, 1 litre.